Decompile code using our Dalvik decompiler, including multi-dex APK. Refactor the analysis to defeat obfuscated code generated by application protectors. Reconstruct resources and obfuscated XML files. Debug Dalvik code as well as all native code (Intel, ARM), seamlessly. Automate and script your reverse engineering tasks via our API. Perform precise and robust decompilation of Android apps and Dalvik bytecode. free tools, is not necessary with JEB (see why it matters). apps, allowing examination of code and hooking of sensitive APIs. Refactor, annotate, navigate, and modify the analysis output. 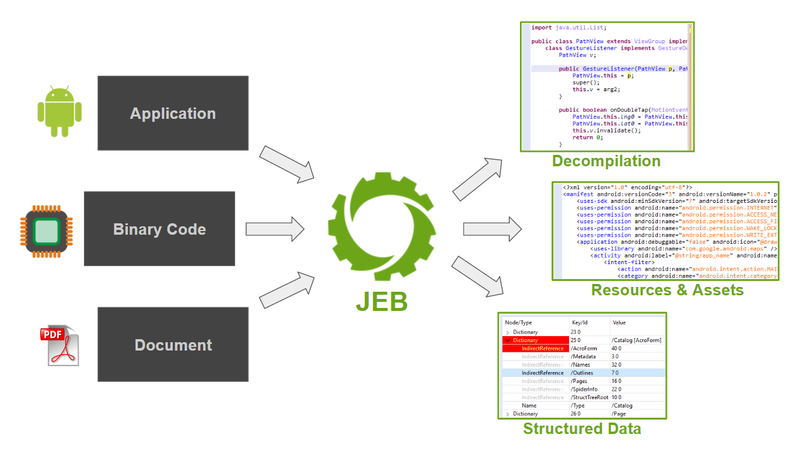 Leverage the JEB API to automate reverse engineering tasks.